The Happy Food Coop is a vision to create a happier, healthier and environmentally sustainable food system; one that prioritises local producers, community empowerment, individuals health and the happiness of society. 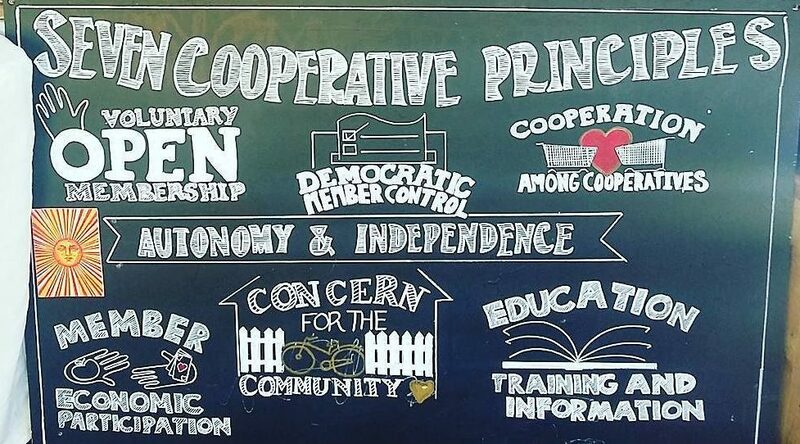 We operate under the principles of the cooperative movement to ensure that we are always working for the benefit of the community and our members. To create change, we need to develop systems that benefit the communities that depend on them. This website is not here to debate the ethics of a plant-based diet – however, we are working on the premise that the meat and dairy industries are Unethical, Unsustainable and a major cause of ill health in our society. We are not trying to dictate that there is only one diet everyone must adhere to – we are suggesting that a wholefood plant-based diet offers all the nutrition for a healthy diet and has been shown to reverse many of the worst of our modern western diseases. And also, that it has the least negative side effects when an effort is taken to ensure all the key nutrients are included.